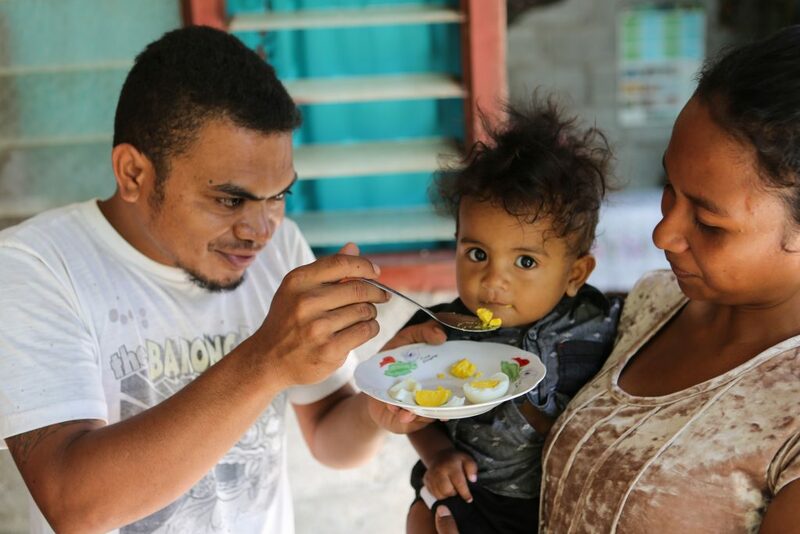 Timor-Leste has the highest level of malnutrition in the Asia-Pacific, and lack of protein represents a critical nutrition gap for pregnant and lactating women as well as children. Most Timorese households raise chickens, with both chicken meat and eggs considered a valuable source of food and income for families. So why does protein consumption remain low, and what would it take to change the status quo? This article is the first in a series produced through the TOMAK Learning & Development Platform. Links to the fully referenced article in both Tetum and English can be found at the base of this page. Timor-Leste has the highest level of malnutrition among countries in the Asia-Pacific region and according to the national government, has shown inadequate levels of improvement in the years since independence was restored. Malnutrition – particularly maternal and child under-nutrition – is the single greatest contributor to premature death and disability in Timor-Leste. Child malnutrition in particular remains very high, with 46 percent stunting in children aged 0-59 months. Stunting is a multi-faceted and complex issue stemming from a variety of historical factors including Timor-Leste’s relatively short history of sophisticated agriculture and competitive markets, and its geography; factors which clearly require a multi-sectoral response. Recognising this, the Government of Timor-Leste has made high-level political commitments, with overarching strategic frameworks and a multi-sectoral coordinating body to provide the foundation for a strong national response to malnutrition (Konsellu Nasionál ba Soberania, Seguransa, Ai-han no Nutrisaun iha Timor-Leste, or KONSSANTIL). A critical nutritional gap for young children, pregnant and lactating women is protein. Evidence shows that low consumption of animal-source foods (such as eggs, milk, meat and fish) is the main cause of iron-deficiency anaemia, especially in poor households. Insufficient consumption of protein has a devastating impact on children as measured by their stunted development, which in turn affects the national development goals of the country. Malnutrition is estimated to result in economic losses of over $41 million annually. While there are financial and labour costs associated with animal production, the vast majority of Timorese households report owning livestock, with chickens among the most popular. Chickens produce highly nutritious meat and eggs, and are also important sources of income. So why is it that protein consumption remains so low? A recently published longitudinal study provides important evidence of the impact of egg consumption as complementary food on reducing malnutrition of children under two years old. Children aged 6 to 9 months from the Cotopaxi Province in Ecuador showed improved anthropometric growth measures after consuming one egg per day as complementary food during 6 months. Eggs also provide greater than 50% of adequate intake for critical nutrients in breastfeeding infants; may offer immune protection; are more affordable than other animal-source foods; and are relatively simple to store and prepare. Why are chicken meat and eggs also good options for Timor-Leste? According to the TOMAK Village Chicken Development Report, over 70% of Timorese households own chickens, with around 65% of chicken flocks being cared for by women. This has important implications for control over production and self-consumption versus sale. On average, a typical household owns 4.5 birds, with a 32% increase in the total chicken population reported between 2010 and 2015. Chickens are also an important part of Timorese culture and utilised during cultural ceremonies. 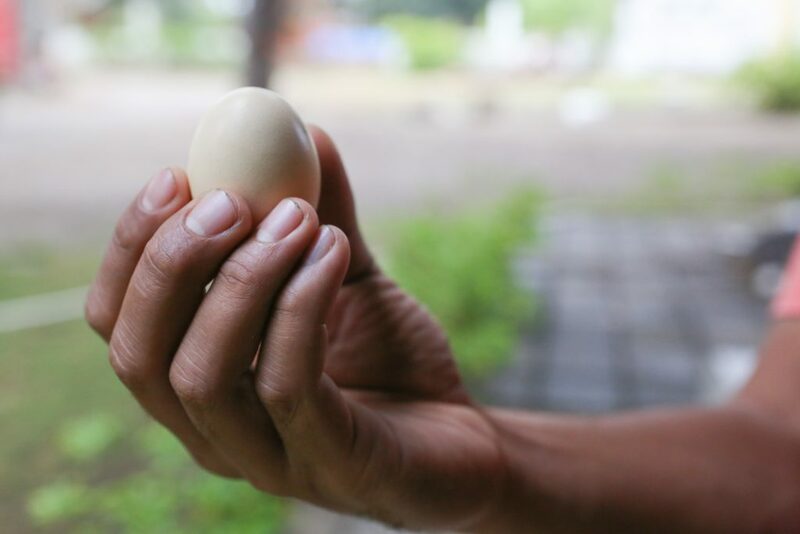 Chicken meat and eggs are generally accepted and valued food sources in Timor-Leste, and are easy to prepare into meals. On average, hens in Timor-Leste produce three clutches per year, with 12 eggs per clutch. Only two eggs per clutch are reportedly eaten by producing households with the remaining 30 eggs incubated per hen per year resulting in 25 chickens hatched. It is reported that the overall survival rate of chickens is as low as 10%. Most chicken rearing conditions are precarious and up to 70% of all chickens hatched die due to predation (cats, dogs, snakes) and lack of protection from the weather. Newcastle’s Disease (ND) is endemic and cited as the number one disease affecting poultry, with other diseases also taking a toll. Typical rural Timorese households raise multiple types of animals at the same time namely sheep, goats, cattle, buffalo and horses. After pigs, chickens are the second most important livestock group (Da Costa Jong, 2016). Chickens commonly roam freely around the house, with only 16% of households providing shelter for their chickens. Chickens are commonly left to scratch and forage for food, with limited supplementary feeding from cracked corn, cassava, coconut, rice and rice bran. Why is a more productive poultry system challenging to develop in Timor-Leste? A village is likely to be affected by Newcastle’s Disease at least once every 2 years. 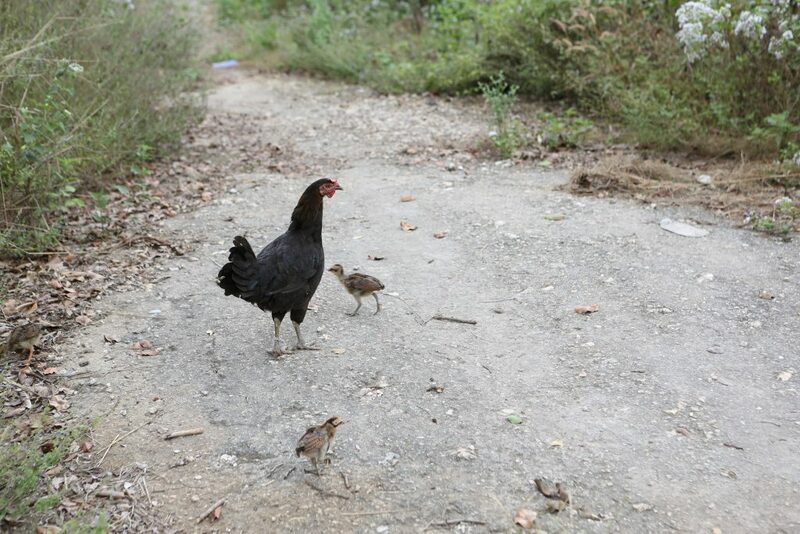 An outbreak can kill most of the chickens in a village within a few weeks. Poultry usually die within days of contracting the disease. While considerable progress has been made by MAF in recent years to improve ND vaccination delivery, national coverage rates remain low. Chickens are generally managed in a low-input, low-output, low-risk, free-range systems relying mainly on scavenged food. Farmers’ knowledge of improved husbandry practices is very low. Newcastle’s Disease reportedly causes 15% of all chicken losses. Losses due to predation often occur in the 6 weeks after hatching, and at night-time when chickens are roosting and nocturnal predators such as cats and snakes are most active. Access to other animal health treatments (e.g. deworming) is virtually non-existent, as is access to poultry-related extension support. Reproduction rates are low, due to sub-optimal nutrition and use of local breeds. Knowledge concerning the nutritional value of eggs and poultry meat is limited. If we know the benefits and the constraints to raising chickens in Timor-Leste, why is change not happening more quickly? Maybe some of the answers lie in the following hard choices. Hard Choice #1: Backyard or intensive systems? In Timor-Leste, backyard chicken farming is a traditional, ingrained production strategy transferred between generations with widely accepted risks and losses. The TOMAK Village Chicken Development Report suggests farmers lack confidence in the efficacy of moving from low input, low output, low risk production strategies to higher input, higher cost and higher risk systems. Such a shift requires farmers to invest more resources and time with ‘unproven’ returns on that investment. Hard Choice #2: Sale vs. household consumption? There are many ways that an agriculture program can link to nutritional outcomes, two of which involve a household directly consuming its production versus selling its production so that it can purchase nutritious food. Programs that aim to both improve food consumption and increase incomes, logical as it seems, are combining twin goals that are in natural opposition with one another. For example, poultry farming can be an excellent source of both income and food for families. However, in practice most households have to opt between the two. This is because with an average of only 4.5 chickens per household, even if all hens are producing three clutches per year, at 12 eggs per clutch only 162 eggs are produced annually for the household. With an average household size of 5.2, the production is far below that required to meet the protein requirements of all individuals in the household, even if all eggs are being consumed. When forced to choose, anecdotal evidence tells us that households prefer to sell the eggs. Therefore, when designing a program that aims to meet both nutritional needs and increase income for targeted producers, household capacities and resources need to be carefully assessed and taken into account. Dynamics around decision-making within households and using limited resources must also be addressed, as food utilisation is almost always being balanced with other competing household demands. The TOMAK Gender Equality and Social Inclusion Analysis (2016) found that despite women being responsible for managing chickens, they have to consult with their husbands before using meat or even eggs for household consumption. It is also important to remember that by focusing on high nutrition agricultural value chains (such as chickens), produce that is sold into local markets is likely to be consumed by other households purchasing them, which will also contribute to improved nutrition for the purchasing households. Hard Choice #3: Local vs. imported chicken meat/eggs? A dilemma exists between relatively cheap imported nutritious foods (meat, eggs and fish among others) which makes a significant contribution to total protein availability, and the effect of these imports on holding back the development of a local production base. A more rigorous analysis is required to better understand the impact of imported chicken meat and eggs on nutrition in Timor-Leste, but government data shows that importers play a substantial role in increasing chicken meat and egg consumption per capita. Despite market prejudice against imported chicken (including concerns it contains chemical ‘poisons’ or is otherwise not healthy to eat), data from the Quarantine Office (presented in the 2014 KONSSANTIL Quarterly Food Security Assessment Reports) shows that in 2014 Timor-Leste imported 16,561 metric tons of chicken meat and 3,850 metric tons of chicken eggs. Meanwhile, data from the 2015 Census indicated that there were 928,806 chickens in Timor-Leste. If each local chicken weighs about 1 kilogram (likely an overestimate), the total quantity of local chicken is only 929 metric tons (equal to 56% of the amount of chicken meat imported annually). Limited supply, high production costs and people’s preference for local chicken meat and eggs is reflected in significantly higher prices for local chickens and eggs, when compared to their imported equivalents. 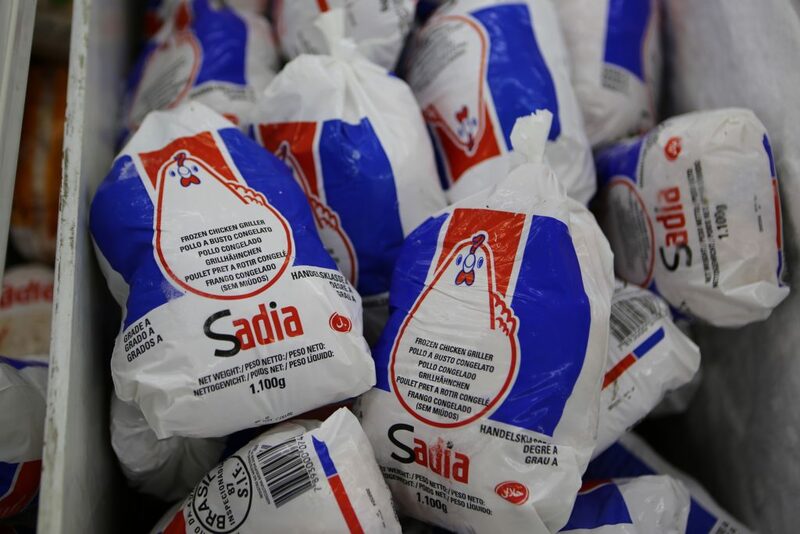 Frozen whole chickens imported from Brazil retail for as little as $US2. Live local chickens on sale for US$10-15 in Dili, Timor-Leste. Hard Choice #4: What comes first, the proverbial ‘chicken or the egg’? For poor farmers to utilise improved inputs and services to improve poultry production, they need access to more reliable and affordable inputs, friendlier financing schemes, as well as access to markets for sale of surplus production. 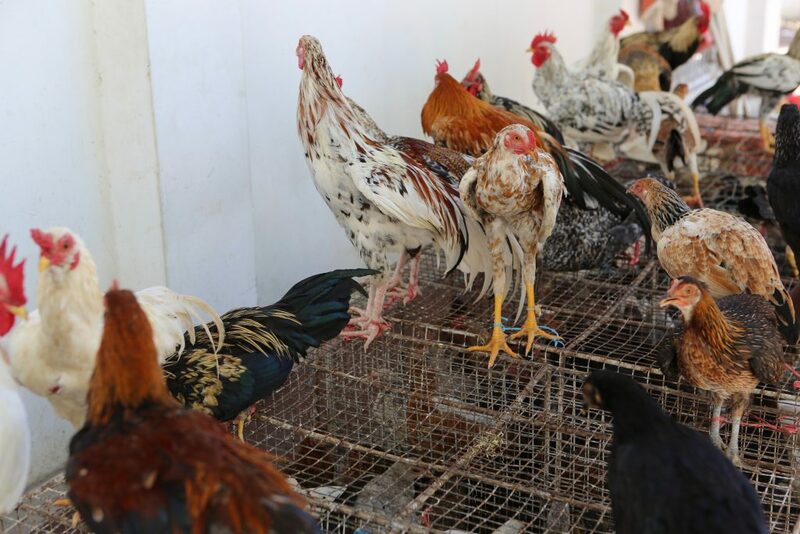 However, current consumer (farmer) demand for poultry inputs and other services does not provide sufficient scale to attract market actors with competitive and affordable inputs and services, or buyers willing to tolerate unreliable, low, and disorganised supplies of eggs. Such a ‘chicken-egg’ situation requires a deeper understanding of underlying systemic constraints and non-traditional ways of addressing these constraints. Rural families and small-scale farmers in Timor-Leste raise chickens for food, income, and cultural reasons using strategies that hold back the potential contribution of chickens to improving nutritional status. They are presented with very real challenges that require a suite of integrated and sequenced interventions that are able to demonstrate convincing results, and are able to be easily implemented by rural households themselves. Strategic subsidies and social behaviour change approaches will likely play an integral part in efforts to increase production of chicken and eggs, and consumption of these protein and vitamin-rich foods by women and young children. While there is potential to further develop larger scale production units, the logical starting place for improved poultry management is at the household level. Commercial production in rural areas is more likely to grow from experienced and specialised households. The fully referenced article is available for download in English and Tetun. Further articles in this series will be made available through our Resources page.